You rely on your vehicle to get you from home to work, to school, and to a variety of other locations on a daily basis. For this reason, it’s essential that you take good care of it, and at Country Town Tire & Auto Service Center, we are here to help. As an auto service center that serves the Hickory, North Carolina area, we provide a number of different services. For example, we do oil changes, fix brakes, sell tires, inspect vehicles, and much, much more. Whether you need someone to fix your vehicle or ensure it’s in good working condition, we’ll make sure all of your needs are met. Our #1 goal is to provide excellent customer service. We realize that when you bring your car into our auto service shop, you want to know it’s in good hands. When you bring your car to us, our ASE-certified technicians will make sure your best interests are protected and that any work done on your car is done right the first time. One of the main things that sets our auto service center apart is the fact that we charge affordable rates. We want to make sure that keeping your car in good working condition at all times doesn’t cost a fortune. If you’d like to schedule a time for service or find out more about what we do, give us a call at Country Town Tire & Auto Service Center today. We are eager to earn your business and look forward to serving you. "The guys here are great. Very friendly. They do good work and you don’t have to wait long for service." "I like this place and the service. They do it right with a great attitude and excellent customer service. I recently needed to replace tires on my car and tried to do it in Virginia. No one had the tires I wanted, and then when I asked them to mount tires from Tire Rack, their prices were ridiculous. Country Town Tire & Auto Service Center graciously accepted the tires from Tire Rack and mounted them on my four wheels for $54.00. They also did it quickly. I made an appointment for 7:30 in the morning, and I was on my way out of their shop by 8:45. I am going to go back for any tire needs I have in NC." "Very nice, polite, and punctual, and the prices are great. I would refer anyone to visit them at their location in Taylorsville, North Carolina." "Excellent service! I highly recommend them! There is a very nice waiting area with magazines & the local paper, but you won’t have much time for reading them because the service is so fast. 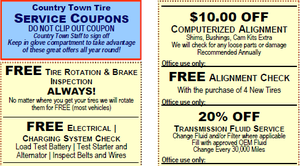 I’ll be visiting Country Town Tire & Auto Service Center again and telling everyone to visit the business, too." "These guys did a repair quickly that literally saved the engine in my truck. Someone else installed a distributor wrong and left it with the timing so far off that the knocking would have killed the motor before long, and then they refused to fix it. I took it straight to Country Town Tire & Auto Service Center, and they squeezed it in late the same day, and then kept it overnight to be sure everything was okay with the engine cold in the morning. Now it purrs like a kitten. Can't thank these guys enough. I'll never take our vehicles to anyone else."